1 in. Furniture Grade PVC Pipe | FORMUFIT - Buy Online — Tagged "Size: 1 in." Home 1 in. Furniture Grade PVC Pipe 1 in. FORMUFIT 1 in. Size PVC pipe is a sturdy, yet easy to manage PVC pipe. 1" PVC pipe has a small amount of deflection (bending) with moderate weight. It is the ideal PVC size for handhold style items, such as fixtures that you can carry or move. Furniture Grade 1" PVC pipe has no manufacturer marks or embossments with a high gloss and clean surface. All FORMUFIT 1 in. PVC pipe is Schedule 40, which has an outside diameter of 1-5/16” (1.315 in.) and an average inside diameter of 1.049 inches. 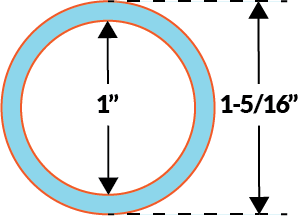 For additional information on PVC pipe dimensions, please see our PVC Pipe Dimensions page. 1" Thinwall PVC Pipe, Furniture Grade - 5 ft.